Hi there again! Actually, this is a false start as I'm not going to begin again properly til mid-May. 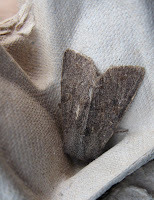 But it's been so sunny here that I dusted down the trap last night and had a go, the first since closedown last year. 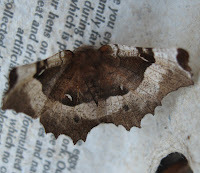 It was worth it, even if the moths don't look and sound over-exciting. As well as a couple of dopey wasps there were these three: a Lead-coloured Drab (mean name or what? 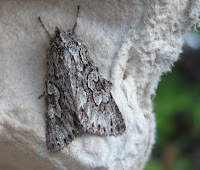 ), an Early Grey, which sounds tea-related and has a lovely, delicate patterning, and a Purple Thorn, which doesn't look purple to me but is quite cheery for an April moth and is the only one in Britain which rests with its wings like that. The Drab and the Grey are described in my book as 'local' in the North of England, so I have hurried news of their arrival to the Yorkshire Butterfly bods. 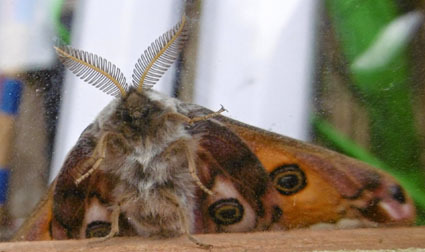 Now I shall pack everything away and leave you, and the moths, in peace for a few more weeks.